Researchers from Kanazawa University reported in the Journal of Materials Chemistry C, the design, synthesis and properties of two co-polymers for organic field-effect transistors with a strong electron accepting unit. 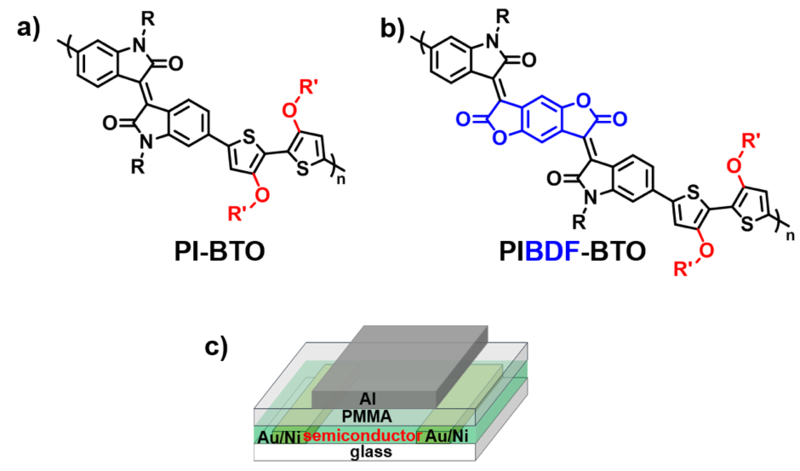 Electronic devices made using polymers as active semiconducting layers are intensively studied, because they can be inexpensive and have advantageous electric and optoelectric properties and mechanical flexibility. The active layer can be processed in solutionleading simple fabrication process. In particular, in organic field-effect transistors (OFETs) the use of co-polymers — polymers made from more than one type of monomer — composed of electron donor and electron acceptor units can result in very high charge carrier mobilities. Now, a collaboration between Kanazawa University in Japan and Dongguk University in Korea, led by Makoto Karakawa and Yong-Young Noh, reports in the Journal of Materials Chemistry C two new co-polymers for high-performance OFETs. To realize high-performance ambipolar OFETs it is important to achieve efficient injection of electrons and holes from an electrode into the highest occupied molecular orbital (HOMO) and the lowest unoccupied molecular orbital (LUMO). To this end, the semiconductor energy gap needs to be small. The authors designed, synthesized and evaluated electrical properties of two co-polymers with small bandgaps based on isoindigo, a strong electron accepting building block; the two co-polymers are called poly(isoindigo-bithio-phene-alkoxyl) (PI-BTO) and poly(isoindigobenzodifurandione-bithiophene-alkoxyl) (PIBDF-BTO). Their degree of crystallinity was investigated by atomic force microscopy and X-ray diffraction, and their photophysical and electrical properties were characterized. The idea behind PIBDF-BTO is that introducing the strong electron withdrawing BDF in the electron acceptor isoindigo unit of PI-BTO. The HOMO and LUMO of the polymer are deepened, leading to stronger intermolecular interaction and high field-effect mobility, on top of better crystallinity of the polymer chain. This polymer indeed exhibits higher field-effect electron and hole mobility and well-balanced ambipolar transport compared to PI-BTO. The lower bandgap of PIBFD-BTO compared to that of PI-BTO also results in more efficient ambipolar charge injection. Moreover, OFETs based on PIBDF-BTO were shown to be operationally stable under continuous cycling measurements. “We believe isoindigo benzodifurandione to be a promising acceptor building block in donor–acceptor conjugated polymers for various applications” conclude the authors. 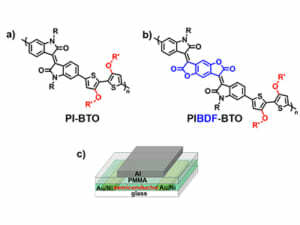 Chemical structures for a) PI-BTO and b) PIBDF-BTO, and (c) organic field effect transistor structure.